Pronation is a term frequently thrown about by shoe companies, form "experts", medical professionals and many others Often it is used as a terrifying term to scare people into motion control shoes, custom orthotics and other excessive, expensive or potentially unneeded devices. While people will claim all kinds of things, the literature is confusing and sparse. So let's take a look at what it actually says in regards to injury risks. 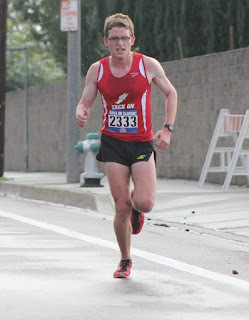 Pronation itself is not a running impairment. It is actually a normal motion associated with multiple joints in the foot (despite usually only being associated with the subtalar joint). It is also an important part of shock absorption at the foot and ankle. Pronation is considered a tri-planar motion, meaning that it has three parts: dorsiflexion, eversion and abduction. The foot and ankle have a great deal of motion potential. Being in a pronated position helps unlock the joints of the foot, allowing the muscles of the foot and ankle to eccentrically absorb the shock of landing. Supination is the opposite tri-planar motion, consisting of plantarflexion, inversion and adduction. Being in a supinated position locks the joints of the foot, allowing the muscles of the ankle to push off during terminal stance from a stable base (foot). These motions are controlled by many muscles of the foot and ankle. While the Posterior Tibialis, Anterior Tibialis invert the foot (and to a degree the calf muscles), the Peroneal muscles all help evert the foot. These large muscles focus mostly on the ankle (except the peroneus longus), while the many small intrinsic foot muscles stabilize the remainder of the foot, particularly the great toe (hallux) and the medial longitudinal arch. Pronation is very important for normal shock absorption, particularly during running. A few studies recently have pointed to the fact that the reverse, a high arched, stiff foot being at an increased risk for injury (Barnes et al 2007). Although most evidence is mixed and has found that both stiff high arched feet and excessively flexible feet have their own set of injury risks. 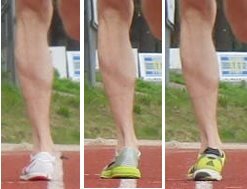 In an optimal situation, during loading response (landing/shock absorption phase), an individual should pronate to absorb shock, then supinate to create a stiff foot to push off from. The problem may occur when individuals stay in a pronated position and do not resupinate. There is not a ton of literature on this and is mostly based on clinical experience. We do know that static foot posture, ie a statically collapsed foot, tells us nothing about injury risk or dynamic motion (Hargrave et al 2003). So those foot scanner devices at your local Dr. Scholls or running store are absolutely useless. "Over" pronation is a difficult thing to quantify. A few studies have tried to quantify it as anything greater than 13 degrees of standing pronation angle (measured by the rearfoot shank) with the average being 9 degrees (Ferber et al 2009). The problem with this we know that accurately measuring active foot motion during running is extremely difficult. So most of what quantifies "over" or "excessive" pronation is just visual identification, which is not accurate. This is why most good movement experts will use motion analysis software. Our eyes and brains are not fast enough to see and observe movement that minute. Typically we can only observe motion great than 5 degrees. The difference between 9 and 13... is 4. While there is evidence that pronation is protective against injury (Barnes et al 2007), there is also evidence that it may cause injuries. Medial Tibial Stress Syndrome may be an associated injury (Yates & Smith 2004) due to the excessive load placed on the larger muscle groups that stabilize the arch. The anterior and posterior tibial muscles are great extrinsic muscles that do well moving the foot and ankle. These are usually some of the tissues associated with the above syndrome. If the intrinsic foot muscles aren't doing their jobs stabilizing the foot, the movers (large muscles) also have to work as stabilizers. This is a great way to overwork them. With excessive tissue stress comes the potential for injury. Medial Tibial Stress Syndrome is a bit of a catch all term and can mean anything from bone injury of the tibia to posterior or anterior tendinosis/itis and more. So that can mean stress fractures (Mayer et al 2014) and or muscle strains . This all goes back to poor shock absorption. Absorbing shock well is important from a muscular standpoint because that is one of the functions of the muscular system. Bones can, but do not repair well from excessive repetitive load. If the load exceeds the capabilities of the muscles without adequate recovery, that is where strains, tendinosis/itis or other muscular injuries come into play. Is the hip driving the foot or is the foot driving the hip? As this website is also dedicated to footwear, we must discuss what influence, if any, footwear has on pronation. The current literature is very mixed. A major study from Ryan et al (2010) out of Nike demonstrated that matching neutral or stability shoe to certain foot types was not only borderline useless, but may increase pain levels during running. This was further confirmed by a study from Kapnik et al (2014): that demonstrated in a large cohort of military personal, choosing running shoes based on arch type (plantar shape) also had no influence on injury rates. A study by Maclean, Davis and Hamill back in 2009 demonstrated that midsole durometer (firmness) only influenced maximum end range rearfoot eversion. Even back in 2001, Dr. Benno Nigg suggested that footwear has less of an influence on foot mechanics than we think. So the term "Motion Control" is incorrect. The actual term is closer to "motion influencer" at best. The most consistent source of correction comes around assessing for what dysfunction is leading to excessive load through the mid tarsal, subtalar, talocrural or other joints. Since pronation is a method of shock absorption, it makes sense that excessive amounts is a symptom rather than a source of injury. So while you need to take a look at the intrinsic foot muscles, which are an important source of arch and ankle stability (Chung, Lee & Lee, 2014), don't forget to also look at how well people are shock absorbing at the joints up above! If an individual has weak quad or glutes, they will not shock absorb well at those joints and may do it excessively at the ankle. So the excessive pronation is a symptom not a source. These are the individuals that get more knee and hip pain when you put them in stability shoes. For more information, I suggest you read the other Running Movement Impairment Posts. For those that may have actual weakness or coordination deficits of the intrinsic muscles of the foot and ankle, giving a supportive shoe may work well short term, but for true function, the individual needs to get stronger. Good coordination and strength will always trump external stability in any form. For those that need some help stabilizing the intrinsic foot muscles, here are a few (of the many) exercises that I use personally and for my patients. Literature demonstrates that the short foot exercise is a highly effective exercise for the intrinsic foot muscles both in the short and long term (Moon et al 2014). I use this frequently for activation of the intrinsic muscles because it is actually a difficult motion to master. Since there is a neuromuscular component to arch stability, having someone try to figure this out will help get their brain involved. This is a high repetition exercise (3 x 20-30 reps) and should be quickly combined with squatting, single leg balance, lunges and single limb squats to increase difficulty and functionality. Image from Runtastic. Switch between the hallux down and the remaining digits elevated to the hallux up and the other digits down. This is another great intrinsic muscle strengthening and coordination exercise. It allows for coordination of the great toe, which is an important pivot point and point of stability for the front half of the arch. The great toe (hallux) is much like the thumb. It has more power and stability capabilities than the other digits and thus must be trained as such. Most of those intrinsic Hallux muscles also have some form of influence over the medial longitudinal arch, which is a significant point of control of foot and ankle pronation. This is another exercise that should be in the higher rep range and optimally should be practiced all day long. If your shoes are not too tight, you should be able to do this anywhere. Optimally this should be done barefoot, but adding a short foot to a lunge increases difficulty. Adding rotation and weight further challenges the muscloskeletal and nervous systems to maintain that position. Like most things in life, balance is important. Pronation is a normal part of foot and ankle motion. Too little or too much are likely not great, because that means either too little shock absorption or too much motion. Getting yourself back in the middle is always a great place to be. So while the literature is extremely confusing, common sense and clinical experience may show that you need both mobility AND stability at your foot and ankle. So why not train both? Getting stronger and more coordinated is ALWAYS a good thing. 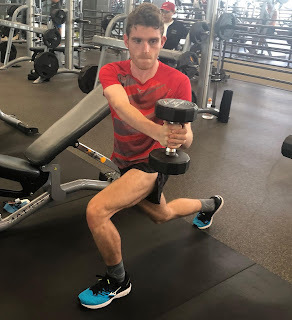 Things like Squats, Lunges, Lateral Band Walks, Monster Walks, Calf Raises, Single Limb Balance and more are all good things to work on for strengthening and balancing the lower body. Pronation has become a complicated motion. People often to control it with posting in shoes, orthotics, tape and more. While that is fine when there is an acute injury, long term management is a different story. You need to get stronger, more stable and find out if this is a local issue or a compensation from elsewhere. So instead of making life more complicated than it needs to be, focus on your little muscles, good shock absorption, being stable and pick your shoes based on what feels good (Nigg et al, 2017), not necessarily what you are told you are "supposed" to wear. 4. Hargrave, M., Carcia, C., Gansneder, B., Shultz, S. (2003). Subtalar pronation does not influence Impact Forces or Rate of Loading During a Single-Leg Landing. Journal of Athletic Training: 38(1): 18-23. 6. Maclean, C., Davis, I., Hamill, J. (2009). Influence of running shoe midsole composition and custom foot orthotic intervention on lower extremity dynamics during running. Journal of Applied Biomechanics: 25(1): 54-63. 8. Nigg, B. (2001). The Role Of Impact Forces and Pronation: A new Paradigm. Clinical Journal of Sports Medicine: 11(1): 2-9. 10. Ryan, M., Valiant, G., McDonald, K., Taunton, J. (2011). The effect of three different levels of footwear stability on pain outcomes in women runners: A randomised control trial. British Journal of Sports Medicine, 45(9): 715-721.